On those hot summer days, there is nothing better to do than to try out some water sports on Crystal Lake! Nothing beats a canoeing trip with some camp friends and spending a nice, relaxing day on the water. Water Sports are an essential part of the summer camp experience, so we make it our priority to provide every girl with a broad range of activities to engage in. Simply put, Waukeela’s waterfront programming is top notch! Nestled alongside Crystal Lake, Waukeela has an excellent instructional location in terms of both safety and convenience. Under the direction of trained professionals, our emphasis is on developing proper technique, following safety practices, and having a ton of fun! Our water sports camp program includes canoeing, kayaking, sailing, swimming, paddle boarding, and windsurfing. We believe that activities on the water are one of the most vital ways to develop life-long skills in a team setting. Our boating program teaches the basics you need to know on the water, as well as the importance of teamwork and communication. The fact is, you won’t be able to make any progress in that canoe if your partner isn’t paddling along with you! That is why we make it our aim to plan activities on the water that educate on the importance of cooperation. Let’s face it, facing your fears and trying out new things can be a nerve-wracking experience! Stepping on a sailboard for the first time and trying to find your center of balance isn’t easy and you can almost certainly guarantee that you might fall in the water a few times! 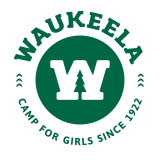 At Waukeela, our waterfront program is built on the importance of providing each girl with an opportunity to learn in a safe and encouraging environment. Girls are separated based on experience level in order to provide each camper with the attention they need, as well as the comfort they deserve.